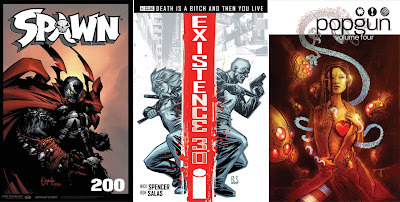 Image Comics keeps getting better in 2010, with these 3 cover shots highlighting their February solicitations. Spawn hits the milestone 200th issue and super-star artists TODD MCFARLANE, GREG CAPULLO (shown), DAVID FINCH, JIM LEE, ROB LIEFELD, MARC SILVESTRI and ASHLEY WOOD each donate a variant cover. Existence 3.0 #4’s brilliant cover is courtesy of RON SALAS, and the best cover I’ve seen in a bit wraps around Popgun, Vol. 4 OGN thanks to BEN TEMPLESMITH. For more on Image in February visit Newsarama.